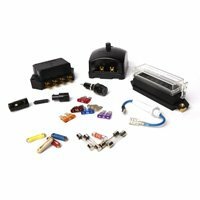 Durite Fuses, Circuit Breakers & Boxes | The Green Spark Plug Co.
Fuses are necessary in an electrical system to protect the circuit and components from excessive current. Excessive current maybe due to incorrect wiring, circuit overload or circuit damage. We stock a wide selection of fusing products such as Durite circuit breakers suitable for 12 or 24 volt and blade fuse type. We also have Durite moulded plastic mounting bases that can be joined together to form a bank. We have wide variety of stock including PAL fuses, Durite flat end glass fuses, blade fuses, fuse holders, mega fuses, JCASE fuses, fuse boxes, MIDI type, JCASE fuses and inline fuses.